Gibson BR-2 Century Model Lap Steel Electric Guitar (1950), made in Kalamazoo, Michigan, black lacquer finish, maple body. The late-'40's BR-2 Century was one of Gibson's most whimsical 1940s moderne creations, the less expensive "little sister" to the uber-stylized BR-1 Ultratone. The Century lap steel is somewhat less deluxe, bit still features a similar oblong asymmetrical body with a backpainted silver Lucite fingerboard. The instrument's visual character was the work of the design firm Barnes & Reinicke, hired by Gibson at the end of WWII to add some new flavor to the company's recipe -- and boy, did they! This is the earliest version of the model and features a black lacquer finish on the maple body, set off with silver and gold accents. A single early pre-P-90 single coil pickup with individual alnico magnet polepieces was originally hidden under a decorative plastic cover, missing on this example. It is a great sounding unit and provides the tonal muscle to back up the Century's slickly moderne looks. It is controlled by an unusual one volume, dual-tone-knob circuit for an added range of sound-this 1950 or '51 model has numbered full-depth plastic knobs. 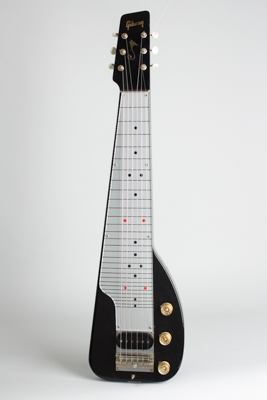 The BR-2 in this form was short-lived (the design was modified in 1951) but remains one of Gibson's most unique and visually striking instruments. Overall length is 32 in. (81.3 cm. ), 8 1/4 in. (21 cm.) wide at lower bout, and 1 3/4 in. (4.4 cm.) in depth, measured at side of rim. Scale length is 22 1/2 in. (572 mm.). Width of nut is 2 1/4 in. (57 mm.). This steel shows some past use but has survived in excellent playing condition overall. The gleaming ebony lacquer body finish shows some dings, scuffs and chips to the edges but no major loss. The decorative molded plastic piece that once covered the pickup and bridge has gone missing (as many have) but this does not affect the instrument's function. There are cracks at the knob bases, typical of this period when Gibson used press-on knobs over solid-shaft pots, which does not work very well. The original Kluson Deluxe strip tuners have newer buttons, the tone caps have been replaced and the bridge retaining screws are later but the steel still looks fabulous, performs as intended and sounds great. Excellent - Condition.